Marugoto Japanese Language & Culture Course is for beginners of Japanese. It is based on the JF Standard for Japanese Language Education, rather than traditional methods of language education that focus on grammar and sentence structure. The aim of the course is to use Japanese language skills to get to know people, visit restaurants and take part in many other Japan-related events. The course does not focus on language alone; learning Japanese culture is also an important element in the lessons. In addition to the Marugoto textbook, learners also have access to the Marugoto Plus supplementary website to help them review and practise their new language skills. This course is perfect for beginners of Japanese who would like to use their new language skills in practical situations, and to really connect with Japanese society. Please subscribe to our ebulletin or check our What's On page to check course dates. 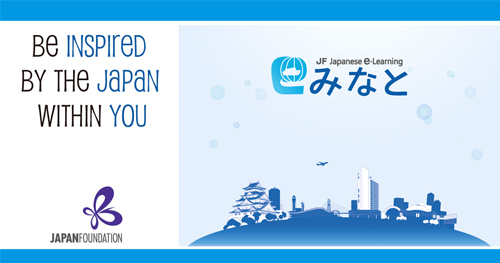 The Japan Foundation Japanese-Language Institute, Kansai has released the Japanese language learning platform, JF Japanese e-Learning Minato, in order to provide an opportunity to study Japanese for all those people in the world who may wish to begin learning, but cannot attend an actual Japanese language school. Find out more here, and try it for yourself! Japanese from Scratch is a series of Japanese language and culture workshops from the Japan Foundation London, suitable for those who are interested in learning Japanese but haven't started yet, or those who have just started learning. Workshops are held for a single evening several times a year, and each workshop focuses on a different theme. By exploring different aspects of Japanese culture, participants not only deepen their knowledge of Japan, but also learn basic Japanese language skills. Please subscribe to our ebulletin or check our What's On page to see when our next Japanese from Scratch workshop will be held. You can read about past Japanese from Scratch courses on our News page here. Japanese Plus is a Japanese language course designed for adult learners interested in updating and refreshing their knowledge about Japan whilst practising their Japanese language skills in a series of evening classes at the Japan Foundation London. Whilst providing a genuine chance to look behind some of Japan's cultural issues, the course will also provide you with an ideal opportunity to improve all four skills of Japanese. The course level is aimed at learners with a Japanese level of approx. JLPT Level 2 / N2 and above. You can read about past Japanese Plus courses on our News page here. Please subscribe to our ebulletin or check our What's On page to see when our next Japanese Plus course will be held. To help you find local classes, click here to see our list of schools, universities and other establishments teaching Japanese in the UK.